when we moved here in 2011, my boys were 10 and 11 years old. 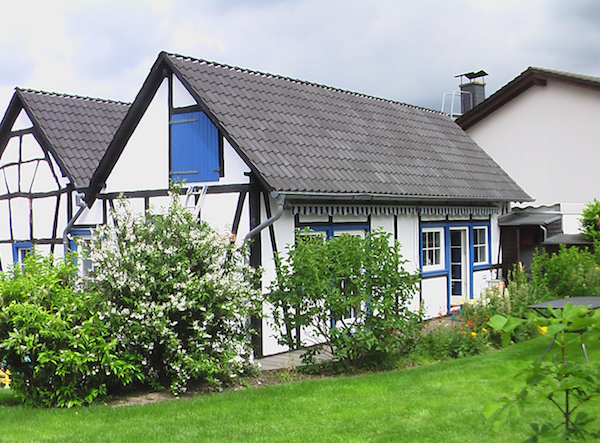 until then we had lived in a true paradise, a 300 year old half timbered farmhouse, that i had completely refurbished myself with the help of a handful of polish guys, who proved to be extremely knowlegdeable and skillful builders. the old rather dark house received a whole new airy and fresh look and was fitted with many windows and doors, all opening to a courtyard – our living room in the sumertime – or to the garden. the garden was huge, flowering with roses, larkspur, lupines and other flowers typical for a cottage garden, trees carrying an abundance of apples, raspberries and walnuts. for a couple of years we grew our own veggies, until later on, bonnie and bullet, a couple of rabbits took the space. this time was as creative as it was idyllic, and since the average german kindergarten is more of an extended toddlers’ group and does not support this sort of creativity due to large groups, mainstream activities and teachers that are more of an supervisor than an educator, we decided to run our own parents’ initiative with 8 kids, a native english teacher and myself as an assistant in our own home. our main goals were do help the kids develop an independent mind and a personality that acts as a civilised human being assuming resonsibility for their peers, the animals that lived with us in the house – our two labradors “sokrates” and “einstein” – the plants in the garden and all the toys and materials they had at their hands. i might come back to this topic in another post in a few weeks time. in that time we came up with a bunch of ideas we would like share with you in this forum. of course, the kids have grown, and developing it appropriate to their age, both my boys have maintained their creativity, along with a strong sense of perseverance. what set our acitivities apart from those of many other kids was that my boys always preferred “analog” play over digital toys. they never showed any interest in computer games, although they saw their friends doing it to an ever increasing extend. this behaviour caused many friendships to split up and sometimes even prevented new ones to grow. as an exception, my younger boy showed some interest in what i did for my job in prepress and asked me if i could teach him rather advanced applications like adobe photoshop, illustrator and quarkxpress (at that time an equivalent to indesign today), because he wanted to write a longer story with illustrations for my mum for christmas. whenever they did something with their computers, they were interested in “productive use”, and this lasts till today. these days they have started to delve into model building from scratch and are learning rather challenging 3D CAD applications. i will try and get them to share their projects in this forum as well! long story short, you will find some of our ideas in this space every now and then. if you have ideas to contribute, please do feel free to add them to this forum.